1 C None No Power Seat 1 C is a standard Business Class Bulkhead seat whose proximity to the lavatory and galleys may be bothersome. 1 D None No Power Seat 1 D is a standard Business Class Bulkhead seat whose proximity to the lavatory and galleys may be bothersome. 1 G None No Power Seat 1 G is a standard Business Class Bulkhead seat whose proximity to the lavatory and galleys may be bothersome. 1 H None No Power Seat 1 H is a standard Business Class Bulkhead seat whose proximity to the lavatory and galleys may be bothersome. 17 A None No Power Seat 17 A is a standard Premium Economy Class seat that may have restricted legroom due to the position of the bulkhead. The position of the bassinet may also be bothersome. There is no floor storage for this seat during take-off and landing. 17 C None No Power Seat 17 C is a standard Premium Economy Class seat that may have restricted legroom due to the position of the bulkhead. The position of the bassinet may also be bothersome. There is no floor storage for this seat during take-off and landing. 17 D None No Power Seat 17 D is a standard Premium Economy Class seat that may have restricted legroom due to the position of the bulkhead. The position of the bassinet may also be bothersome. There is no floor storage for this seat during take-off and landing. 17 E None No Power Seat 17 E is a standard Premium Economy Class seat that may have restricted legroom due to the position of the bulkhead. The position of the bassinet may also be bothersome. There is no floor storage for this seat during take-off and landing. 17 G None No Power Seat 17 G is a standard Premium Economy Class seat that may have restricted legroom due to the position of the bulkhead. The position of the bassinet may also be bothersome. There is no floor storage for this seat during take-off and landing. 17 H None No Power Seat 17 H is a standard Premium Economy Class seat that may have restricted legroom due to the position of the bulkhead. The position of the bassinet may also be bothersome. There is no floor storage for this seat during take-off and landing. 17 K None No Power Seat 17 K is a standard Premium Economy Class seat that may have restricted legroom due to the position of the bulkhead. The position of the bassinet may also be bothersome. There is no floor storage for this seat during take-off and landing. 21 A None No Power Seat 21 A is a standard Premium Economy Class seat whose proximity to the lavatories and galley may be bothersome. 21 C None No Power Seat 21 C is a standard Premium Economy Class seat whose proximity to the lavatories and galley may be bothersome. 21 D None No Power Seat 21 D is a standard Premium Economy Class seat whose proximity to the lavatories and galley may be bothersome. 21 E None No Power Seat 21 E is a standard Premium Economy Class seat whose proximity to the lavatories and galley may be bothersome. 21 G None No Power Seat 21 G is a standard Premium Economy Class seat whose proximity to the lavatories and galley may be bothersome. 21 H None No Power Seat 21 H is a standard Premium Economy Class seat whose proximity to the lavatories and galley may be bothersome. 21 K None No Power Seat 21 K is a standard Premium Economy Class seat whose proximity to the lavatories and galley may be bothersome. 3 C None No Power Seat 3 C is a standard Business Class seat whose proximity to the lavatory and galley may be bothersome. 3 D None No Power Seat 3 D is a standard Business Class seat whose proximity to the lavatory and galley may be bothersome. 3 G None No Power Seat 3 G is a standard Business Class seat whose proximity to the lavatory and galley may be bothersome. 3 H None No Power Seat 3 H is a standard Business Class seat whose proximity to the lavatory and galley may be bothersome. 45 A None No Power Seat 45 A is an Economy Class seat that may have extra legroom due to the exit however, the close proximity to the lavatories and galley may be bothersome. The tray table is in the armrest, making the armrest immovable and slightly reducing seat width. There is no floor storage for this seat during take-off and landing. 45 C None No Power Seat 45 C is an Economy Class seat that may have extra legroom due to the exit however, the close proximity to the lavatories and galley may be bothersome. The tray table is in the armrest, making the armrest immovable and slightly reducing seat width. There is no floor storage for this seat during take-off and landing. 45 D None No Power Seat 45 D is a standard Economy Class seat that may have restricted legroom due to the position of the bulkhead. The proximity to the lavatories, galley, and position of the bassinet may be bothersome. There is no floor storage for this seat during take-off and landing. 45 E None No Power Seat 45 E is a standard Economy Class seat that may have restricted legroom due to the position of the bulkhead. The proximity to the lavatories, galley, and position of the bassinet may be bothersome. There is no floor storage for this seat during take-off and landing. 45 F None No Power Seat 45 F is a standard Economy Class seat that may have restricted legroom due to the position of the bulkhead. The proximity to the lavatories, galley, and position of the bassinet may be bothersome. There is no floor storage for this seat during take-off and landing. 45 G None No Power Seat 45 G is a standard Economy Class seat that may have restricted legroom due to the position of the bulkhead. The proximity to the lavatories, galley, and position of the bassinet may be bothersome. There is no floor storage for this seat during take-off and landing. 45 H None No Power Seat 45 H is an Economy Class seat that may have extra legroom due to the exit however, the close proximity to the lavatories and galley may be bothersome. The tray table is in the armrest, making the armrest immovable and slightly reducing seat width. There is no floor storage for this seat during take-off and landing. 45 K None No Power Seat 45 K is an Economy Class seat that may have extra legroom due to the exit however, the close proximity to the lavatories and galley may be bothersome. The tray table is in the armrest, making the armrest immovable and slightly reducing seat width. There is no floor storage for this seat during take-off and landing. 55 A None No Power Seat 55 A is a standard Economy Class seat in the last row of the aircraft whose proximity to the lavatory and galleys may be bothersome. 55 C None No Power Seat 55 C is a standard Economy Class seat in the last row of the aircraft whose proximity to the lavatory and galleys may be bothersome. 55 D None No Power Seat 55 D is a standard Economy Class seat in the last row of the aircraft whose proximity to the lavatory and galleys may be bothersome. 55 E None No Power Seat 55 E is a standard Economy Class seat in the last row of the aircraft whose proximity to the lavatory and galleys may be bothersome. 55 F None No Power Seat 55 F is a standard Economy Class seat in the last row of the aircraft whose proximity to the lavatory and galleys may be bothersome. 55 G None No Power Seat 55 G is a standard Economy Class seat in the last row of the aircraft whose proximity to the lavatory and galleys may be bothersome. 55 H None No Power Seat 55 H is a standard Economy Class seat in the last row of the aircraft whose proximity to the lavatory and galleys may be bothersome. 55 K None No Power Seat 55 K is a standard Economy Class seat in the last row of the aircraft whose proximity to the lavatory and galleys may be bothersome. 7 A None No Power Seat 7 A is a standard Business Class Bulkhead seat. 7 C None No Power Seat 7 C is a standard Business Class Bulkhead seat. 7 D None No Power Seat 7 D is a standard Business Class Bulkhead seat. 7 G None No Power Seat 7 G is a standard Business Class Bulkhead seat whose proximity to the lavatory may be bothersome. 7 H None No Power Seat 7 H is a standard Business Class Bulkhead seat whose proximity to the lavatory may be bothersome. 7 K None No Power Seat 7 K is a standard Business Class Bulkhead seat whose proximity to the lavatory may be bothersome. This Boeing 787-800 (788) V2 seats 161 passengers and is primarily used on International routes. Japan Airlines is the first airline to operate the Boeing 787-800 Dreamliner service to and from North America. The cabin has been updated with the latest features and amenities including larger overhead bins and windows, dimmable shades, higher ceilings, lower cabin pressure, personal ventilation air vents above each seat, Audio Video on Demand with large touch screen LCD's, Sky Bar, and LED mood lighting throughout the aircraft. 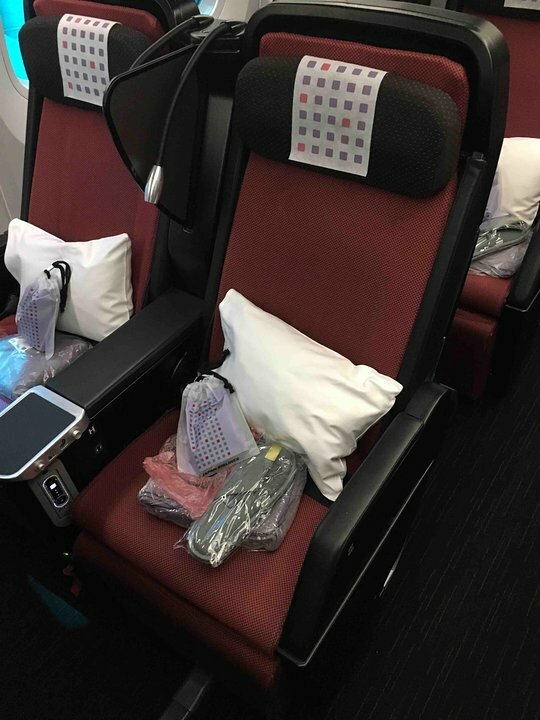 Awesome Premium Economy Seat - more than enough legroom and width - I also sat in 20K and there was enough room to get in and out without 20H having to get up. Highly recommend - the 787 was whisper quiet too - you could hear people slurp their noodles. Also its a lie diagonal but flat experience so very comfortable, even got a few hours sleep. Flew from Narita to Bangkok on Sky Suite 8 Business Class. Very comfortable full-flat seat and excellent meal.Window seats have a little less storage space than aisle seats. Flew JAL 11 from DFW-NRT. I must say, it was a miserable flight. Not only was it hot 27-28C (like all JAL flights), I was on the sun side of the jet, and since there are no physical shades (only darkening glass), the heat radiating off those added to the ambient heat. I requested from every attendant I saw to reduce the temp, all of which acknowledge the request (very polite) but to no effect. One did bring me two rubber mats to place over the windows, but they don't fit very well and really don't help. This return flight will be my last on JAL. While they have better equipment, food, staff, seat width/pitch; the temp is just a deal breaker. Upgraded to business class from premium economy due to some group booking. It was an night flight KUL-NRT. I'm a big guy (100kg) and although I enjoyed the food and onboard entertainment, the seats were just to thin when in lie flat position for a comfortable sleep. Slightly angled up made it much better. There was no bassinet at this seat during my flight; I think it can be and is removed when there is no passenger flying with an infant. This seat should be marked green because it has at least a foot, if not more, of extra legroom compared to other seats in premium economy. Highly recommend this seat on this plane, and also JAL! The 15 hour flight was actually enjoyable rather than horrifying! The "version 2" 787-8 aircraft currently operating JFK-NRT is very nice. Business suites are 2x2x2 with windows having aisle access very similar to the 2x3x2 all aisle access suites on the 777-300ER. Warning -- unlike the 777-300ER there is no internet service. Premium economy looked lovely and economy looked very comfortable with the SkyWider seats. You MUST AVOID for long-haul flights the "version 1" aircraft. Mystifyingly outdated angle-flat business class seats. You can tell because the "version 1" offers no Premium Economy section. Great seat on an awesome aircraft. Flew jfk-nrt on jal 003. When you board you first realize how high to celings are. They have to be double the hieght of the celings on a 777. Then you realize your in sky wider 2 with huge seats. 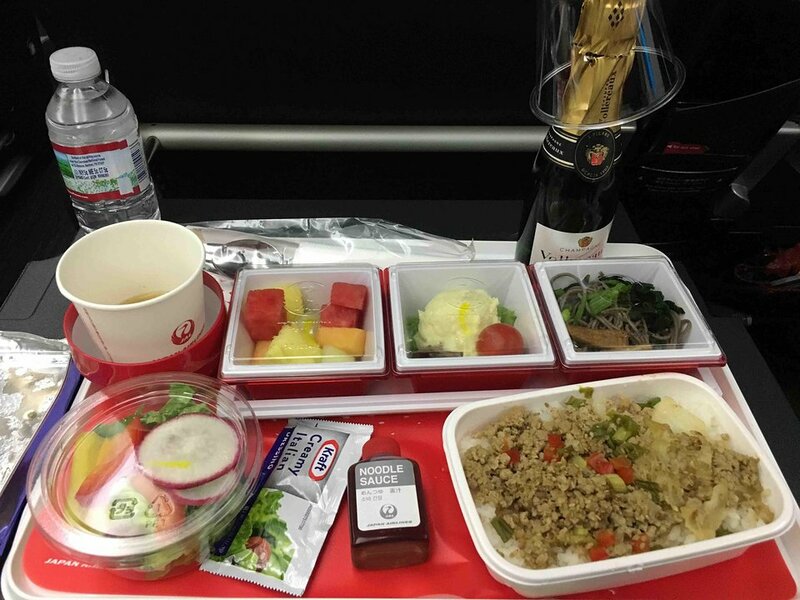 So by then the FA comes around with food which is good tasting but after the flight I got sick from it. The entertainment options are good . Not so much for english speakers like me but what should you expect from an economy class seat. Overall 4.8 stars.